I think that now, in 2014, people have realised that hybrid cars aren’t just for the “organic crunchy” types who live on lentils and wear unbleached hemp trousers. Hybrids are for everyone to enjoy, with the fuel economy and the reduced impact on the environment being bonuses (OK, reduced environmental impact if your local electricity is not generated by fossil fuels – but that’s another story). 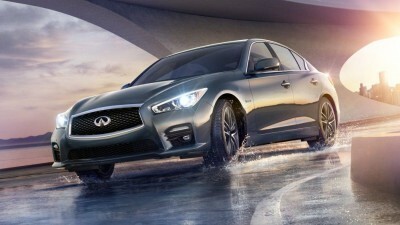 So it shouldn’t come as a surprise that Infiniti’s very popular Q50 range also comes in a hybrid version. The Infiniti Q50 hybrid packs a lot of elegance and power into one package. You can even, should you be inclined, take it off the road with the Infiniti Q50 hybrid AWD variant. However, the exterior styling won’t really give you much ground clearance, so the four-paw functionality is best kept for enhanced handling on the roads or for rolling over grass to get to your favourite country picnic spot. The overall styling of the Infiniti Q50 hybrid is somewhat on the aggressive side, with sharply angled lights giving an impression of va-va-voom from the side, which is enhanced even further by the front air dam, the 19-inch alloy tyres and the general chunky appearance of the front end. However, the clean and slightly curvaceous lines in the rest of the car lend an air of elegance and refinement to temper the feistiness of the front. It does so without looking jarring, it has to be said. The scratch-shield paint protection ensures that the Infiniti Q50 hybrid will stay looking sleek and elegant. driver-adaptive transmission that “learns” your driving style and changes gears accordingly. As if the ability to select the Sport Driving mode if you want to boot it a bit wasn’t enough customisation (as opposed to selecting Standard, Snow, Eco or Personal). The transmission system also features downshift rev matching. 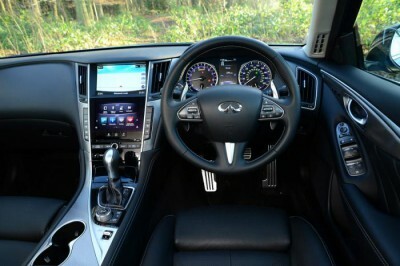 There are plenty of other handy driver aids inside the Infiniti Q50 hybrid: hill start assist, speed sensitive power steering, the works with the brakes (EBD, ABS and brake assist), traction control and vehicle dynamic control (this is Infiniti’s stability package) and intelligent cruise control that automatically slows the car down when the traffic around you also slows down. The rear view camera with back-up collision prevention (meaning that if it detects that you’re going to back into something, it will brake automatically) and the all-round view monitor for when you’re parking also come in handy. The Infiniti Q50 hybrid is set up to help the driver in many other ways beyond the on-road handling and performance. There’s no need to led road noise diminish your listening pleasure thanks to the active noise control function on the sound system. The 14-speaker sound system in question can be controlled with voice recognition and it has all of the forms of input you can think of, from your traditional AM/FM radio through to CD, DVD, auxiliary input, iPod and USB input. The audio system’s not the only thing that works with voice recognition: the Bluetooth connectivity for phone and SMS messaging also can hear what you’re saying. However, you’re not confined to the use of voice recognition – you can also let the Infiniti Q50 hybrid know what you want with the dual touch-screen displays (one’s 8 inches, one’s 7 inches and both are colour). You can add a third “screen” with the smartphone connection. The audio system and the Infiniti In-Touch apps are keeping your mind comfortable during your drive (although we hope you give most of your attention to actually driving – the Infiniti Q50 hybrid has good passive safety features and tons of airbags but all the same, checking your email and going on Facebook aren’t smart things to do while driving). The Infiniti Q50 hybrid is also good at keeping your body comfortable, what with the 8-way electrically adjustable front seats (the driver’s has lumbar support) and the dual-zone climate control function with automatic recirculation. Other creature comforts can be catered to with the array of cup and bottle holders, and the air purifying system. Even the key for the Infiniti Q50 hybrid is practically a butler in your pocket. This smart key doesn’t just remotely open your doors like the old ones do. No, the I-key also shuts the windows automatically, unlocks the doors, unlocks the boot and can even start your engine. From your pocket. All you need to do is to touch the door or boot. This key is also smart enough to stop you locking it in the car by mistake – it’ll unlock the doors and honk the horn at you if you do. 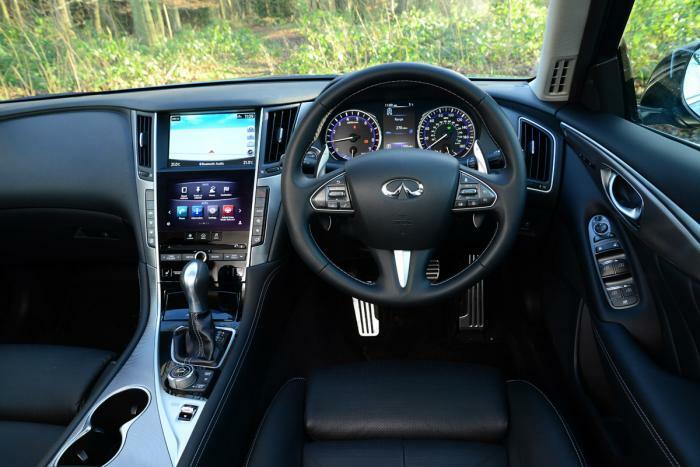 You might think that with all these gadgets at your fingertips inside the Infiniti Q50 hybrid that the interior might look cluttered. Although it would be rather hard for anything this spacious to look cluttered inside, we’re pleased to note that the dashboard is laid out so things look neat and convenient and not particularly cluttered. It doesn’t clash at all with the leather-faced upholstery and the aluminium interior trim. The Infiniti Q50 hybrid is bound to appeal to those who like to be up-to-date technologically but who still enjoy the basic fun of driving. For any more information on the Infiniti Q50 Hybrid, or for that matter any other new car, contact one of our friendly consultants on 1300 303 181. If you’d like some fleet discount pricing (yes even for private buyers! ), we can submit vehicle quotes requests out to our national network of Infiniti dealers and come back with pricing within 24 hours. Private Fleet – car buying made easy!